Milwaukee County Emperor Chris Abele convinced Dan Adams (a wholly owned subsidiary of the Abele Party) to run for the Assembly District 19 seat, which was opened up when Jon Richards chose to run for Attorney General. Abele wanted to increase his "sphere of influence" in Madison, because the Teapublicans he was paying off just wasn't enough. Adams started running his campaign with a platform of being against potholes and for buy-partisanship. Predictably, that agenda did not go over well in one of the most progressive areas of the state. So the Abele/Adams campaign decided to change their strategy from winning the race to running a "anyone but Marina Dimitrijevic" smear job. It started a couple of weeks ago when a "concerned citizen" supposedly did an open records request and found that Dimitrijevic didn't use the courthouse parking lot very much. This "concerned citizen" then leaked this information to members of the corporate media, like Dan Bice and Charlie Sykes, who exclaimed that this showed she wasn't working hard enough! Of course, this was nonsense. Being a county supervisor is hardly a 9-5 office job. Dimitrijevic is well known for being in the community a lot, holding hundreds of town hall meetings and attending numerous events. Also, Dimitrijevic is known for being a big supporter of the transit system and often rides the bus. For people to jump to such silly conclusions without doing basic research is simply irresponsible. It turns out that the "concerned citizen," Joe Trawitzki, didn't actually do the open records request. That was done by Attorney Sam Hall, who is a supporter of Adams. So not only Adams tried to smear Dimitrijevic, he also tried to cover up his role in the dirty deed. A few days later, Bruce Murphy of the blog Urban Milwaukee, who has been a long time fan of all things Abele, launched a screed against Dimitrijevic, accusing her of "sheer ambition." Although it's hard to tell what Murphy is angry about, it appears that he is upset because she would leave her job as a county supervisor if she wins the election. Murphy apparently wasn't aware of this and took away one of his attack points, although he sure tried to use it anyway. I must add that I am disappointed in Murphy's choice of words. All too often, when a woman politician seeks higher office, people use words like "sheer ambition," which they never would use for a man doing the same thing. Then again, this isn't the first time that Team Abele has shown misogyny towards Dimitrijevic. His mouthpiece, Brendan Conway, referred to Dimitrijevic as a "mean girl," something for which Abele's office still needs to apologize. Abele also attacked Dimitrijevic, saying she was only concerned about not getting paid as much. He did this on Equal Pay Day, an event to draw attention to the fact that women don't get paid as much as men. There is so much wrong with this flier, it's hard to know where to begin. Heck, it's difficult to just get past the immaturity and poor quality of the flier. They obviously are so desperate to keep Dimitrijevic and couldn't find suitable headlines to support their baseless attacks that they had to make up their own headlines and cherry pick the quotes used. I have no clue as to why they chose to add Jonathan Brostoff to be a victim of their pettiness. Brostoff hasn't been with the county for years and even when he was a county worker, he was a legislative aide to Chris Larson, and never an elected official. 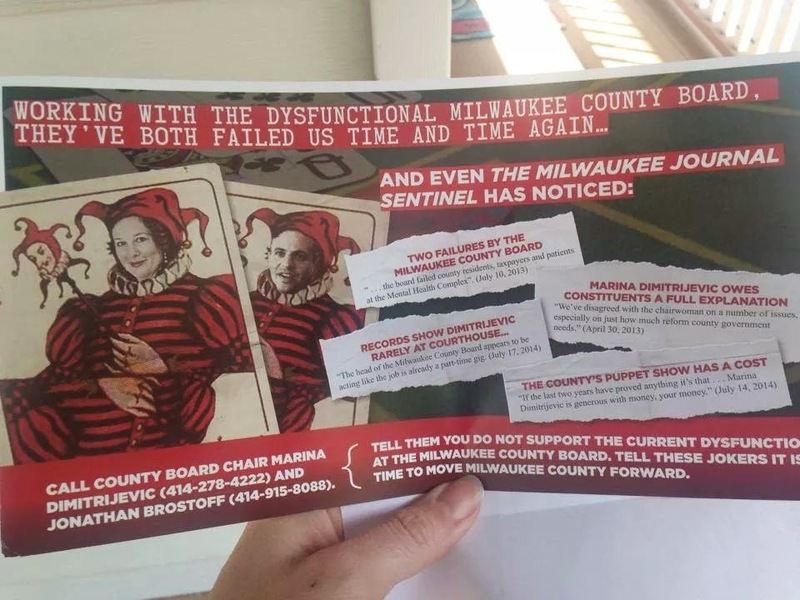 I should also note that Forward Milwaukee County has had done Abele's bidding before, even if it meant breaking the law and sending emails to county workers and officials at their county email addresses, telling them out to vote on the red herring referendum last spring. All of this negativity, immaturity, misogyny and out right lying show that neither Adams nor Abele or really fit for public office. That said, I also want to congratulate Dimitrijevic and her two other opponents, Brostoff and Sara Geenen, for running positive campaigns focused on their own qualifications and agendas and not responding to the mud being flung by the Abele/Adams campaign. At least Abele has dropped the fallacious line about this not being personal. It's obviously very personal for him. That is why, while I am supporting Dimitrijevic in this race, I won't be disappointed if either Brostoff or Geenen would win. The Abele/Adams types really do seem like obnoxious spoiled children. I don't even get the point of that flier is, at least in a Dem primary. It certainly won't get anyone to vote for Adams, so why do it? But when you have corporatists who think that politics only exists as a means to grab power and funnel money to their buddies, I suppose you might act like Adams and Abele. As Mike Ellis might say: "Abele is for Abele", and no one and nothing else.